An impressive achievement here from Naxos, and a vindication of the label’s ambition to make comprehensive recordings of important repertoire. Max Reger seems doomed to a niche status at best, at least in the English-speaking world, but there is some wonderful music here, much of it very well played, that deserves a far wider audience. Bernard Haas, Ludger Lohmann, Josef Still, Hans-Jürgen Kaiser, Stefan Frank, Martin Welzel, Edgar Krapp, Christian Barthen, Kirsten Sturm, Wolfgang Rübsam. This scattergun approach may have been the result of practical concerns, but it provides welcome variety, both in terms of the interpretive approaches of the players and the timbral qualities of the instruments. There doesn’t seem to be much connection between the scale of an individual piece and the properties of the instrument chosen to play it on, but that’s fine; Reger’s organ music generally responds well to large, modern, German-sounding instruments, as all of these are. Most of the organs were built in the 20th century, and all are big. Four manuals is the norm, with a registration list (given with every disc) that fills at least a page of the booklet. The largest of them are the Passau Cathedral Organ and the Rockerfeller Memorial Chapel Organ (in Chicago, the only one not in Germany), and in both cases an extra dimension of power is always apparent. The Rockerfeller is a particularly impressive instrument, a very clean, direct sound, the sheer power never compromising the tone or balance. But my favourite among these organs is the 1974 Klais at Trier Cathedral. It too has impressive clarity – as played by Josef Still – and a real feeling of power, despite a fairly modest registration. But there is also a lot of character to this instrument – warmth, richness and timbral complexity that makes its tone endlessly fascinating. The Passau and Fulda Cathedral organs sound a bit old and wheezy by comparison, but all are fine instruments, and well-suited to the repertoire. The collective nature of the enterprise invites comparison between the players. The first two volumes are both played on the Link Organ at Giengen an der Brenz, the first by Bernard Haas and the second by Ludger Lohmann. Lohmann finds far more colour and variety in the instrument, making this second volume (opp. 127, 129 and 135a) one of the highlights of the series. Reger expects much of his performers in terms of decisions on rubato, dynamics and swell, and all of the players here offer imaginative interpretations. He also poses continual dilemmas about the balance between atmosphere, heft, and contrapuntal clarity, dilemmas that here involve the sound engineers as much as the players themselves. But again, appropriate solutions are always found, usually by tipping the balance slightly one way or the other. A typical programme for a single disc here will open with a large-scale single work, a prelude and fugue or similar, before moving on to a cycle of smaller pieces: character pieces or chorale preludes. Clarity of line is achieved throughout, but is really prioritised in the quieter works. The repertoire itself is satisfyingly varied, although the quality and interest varies. Highlights from the larger scale works include the Fantasia and Fugue on the name B-A-C-H, op. 46, Variations and Fugue on ‘Heil, unsern König Heil’ (i.e, God Save the Queen), and the Symphonic Fantasia and Fugue, op. 57, elsewhere described, although not here, as the “Inferno Fantasie”. Some of these concert works are truly colossal, the Introduction Passacaglia and Fugue in E Minor, op. 127, times in at 28:18, and the Introduction, Variations and Fugue in F-sharp Minor, op. 73, at 37:13. Both fully justify their durations though, through a combination of adventurous harmonic progressions and continually inventive contrapuntal intrigue. On the other hand, the suites and sonatas (two of each), which are on a similar scale, often get bogged down in generic and formal convention and can be a slog, despite impressive advocacy here from Frank, Barthen and Sturm. The shorter, and usually quieter, works are generally a more inviting proposition. Sets like the Seven Organ Pieces, op. 145, and the Twelve Pieces, op. 65, offer variety and contrast, and even energy and rhythm, without overly involved counterpoint and development. The chorale preludes take up a large proportion of this collection, dominating volumes 2, 8, 9, 10, 11, 14 and 15. But here too there is much variety and interest. One of Reger’s big failings was his inability to write memorable tunes, so having famous Lutheran chorales underlying the counterpoint (arguably his greatest strength) in each of these works to his advantage. So too does the fact that so many different organists are assigned the chorale preludes, each bringing different ideas about texture and colour. As a result, the chorale preludes, which might otherwise risk monotony over their many hours, become another highlight of the collection. 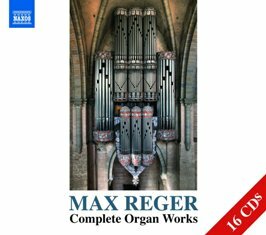 This set is one of four complete cycles of Reger’s organ music currently available or soon to be completed. The hundredth anniversary of Reger’s death falls in 2016, which may explain some of the recent interest in his work from recording companies. The other three cycles are each executed by a single performer, no doubt bringing coherency of interpretation, although at the expense of the variety that makes this cycle so attractive. The strongest of the three competitors is Bernhard Buttmann on Oehms. His cycle is being released as four four-disc boxes, one a year with the last appearing in 2016 to coincide with the anniversary. Buttmann uses different organs – on the third volume each disc is played on a different instrument - but the audio quality seems to be equally high throughout. That said, the Oehms engineers are at a pains to bring up the pedal sound, giving the bass impressive presence but losing some of its focus. Buttmann’s interpretations are certainly impressive though, not least for the manual dexterity he brings to Reger’s complex counterpoint. A cycle by Rosalinde Haas on MDG gives another perspective on Reger’s music. She plays the Albiez-Organ at Frankfurt/Main-Niederrad, continually choosing narrow registration mixes for focussed, if underpowered, sounds. Clarity of line is her overriding concern, and Reger’s counterpoint has never sounded clearer. But her tempos are almost always way above the norm. Her rendition of the Fantasy and Fugue on B-A-C-H, op. 46, for example, comes in under 14 minutes, where Buttmann and Hans Jürgen Kaiser on this cycle are both around 20. That may explain how Haas manages to squeeze her cycle onto 12, rather than 16, discs, although the discrepancy also suggests some omissions. Finally, there is a cycle, I assume it is ongoing as only nine volumes are available, from Roberto Marini on the Fugatto label. He too uses a range of different organs, including the one at Fulda Cathedral featured on this cycle and Bruckner’s organ at St. Florian. From the little I’ve heard, Marini gives dramatic accounts, with more rubato than on other cycles, but the sound quality doesn’t match any of the competitors. The Naxos or Oehms cycles would therefore seem to be the top choices. The variety offered by this Naxos cycle is one of its greatest strengths, even if the inspiration behind the performances is one of the factors that vary. But the sound quality is consistently good, and the vast majority of the music here is well worth hearing. Hopefully strong sales of this set will encourage further exploration of Reger’s music by Naxos. A similar box set of his chamber music (which runs to 23 volumes on the frustratingly deficient Da Camera Manga set) would be welcome indeed. Simon Rattle hasn’t established much of a reputation as a Wagnerian, which is surprising, given the number of well-received concert performances and stagings he has conducted: Tannhäuser at Covent Garden, Walküre and Lohengrin with the Berlin Philharmonic, Götterdämmerung at Vienna State Opera, and no doubt others too. This Rheingold demonstrates that he knows what he is doing. It’s a dramatic reading, but not one that’s overly driven into exaggerated gestures and over-fast tempos. Rattle shapes the music effectively, and the results are distinctive, and free of the tempo affectations that he has a habit of introducing into core-repertoire works. It is a concert performance (edited together from two evenings), originally broadcast live on Bavarian radio. No suggestion here that a full cycle is planned, which is a shame, because this a great reading that stands up well to comparison with any recent competition. 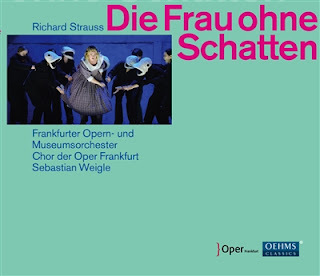 The recording is presented in standard CD audio, but the quality is high, even higher than on the live broadcast, put out on the internet at BR Klassik’s impressive streaming rate. There seem to have been some balance adjustments since, with the bass boosted in many of the tuttis. That gives real weight and presence to the double bass pizzicatos, and to the lowest of the timpani, but both lose some tonal focus as a result. The much-derided acoustic of the Herkulessaal sounds fine here, warm and spacious but never to the detriment of the music’s details. You won’t mistake this for a stage performance. There is little of the dramatic frisson that live staging brings, and little sense that the singers are ever communicating with each other. Rattle also takes some tempo indulgences that he probably would not get away with in the pit, the slow tempo of the transition into the second scene a prime example. The singers are arranged along the front of the stage, and all seem to be stationary. For some reason, most of the singing comes out of the left channel, although the photo on the back of the booklet shows the singers to be evenly distributed from left to right. High quality audio can often ruin a quiet opening, the sheer fidelity of the reproduction preventing the music from appearing out of silence. The first note here is clearly audible, yet the mystique remains. Here, and throughout, Rattle makes everything sound definite and deliberate, but without descending into pedantry. A few minor tuning problems in the Wagner tubas at the first statement of the Rheingold theme is about the only fault to be found with the otherwise excellent orchestral playing. The Bavarian Radio Symphony Orchestra isn’t quite as distinctive in its string tone as Rattle’s Berlin band, nor as rich in its wind sound, but the result is that the players never hog the limelight, insuring the singers always take centre stage. A vocally well-matched trio of Rhinemaidens introduce the Alberich of Tomasz Konieczny. His voice is impressively consistent, even across the broad dynamic range of the part. His voice is clear, but with a suitably dark edge. And he has the ideal menacing laugh. Michael Volle is better known for his Beckmesser, but he makes a good Wotan too. His voice is low for the role, with a more bassy presence than we usually hear. His enunciation is excellent, and the lilt of his slow, wide vibrato makes for a continually attractive tone. Elisabeth Kulman is similarly clear as Fricka, her tone satisfyingly earthy. She has a habit through, of adding swooping portamentos into the line; it’s a daring effect but it’s often too much. No real weak links in the remaining cast. Eric Halfvarson is a known quantity as Fafner, and he has considerably more weight and presence than Peter Rose as Fasolt. Burkhard Ulrich, as Loge, has a fast, hectoring vibrato, not too unpleasant, but it really makes him stand out from the rest of the cast. He also struggles to sustain to the ends of phrases in the, admittedly very difficult, last scene. Janina Baechle gives a suitably mysterious Erda, her tone ravishing. Sadly, Rattle doesn’t make much out of her appearance – it doesn’t interrupt proceedings as it should. Benjamin Bruns sounds a little insecure as Froh, but only by comparison to the rest of this stellar cast. And some wonderful singing from Annette Dasch as Freia, though the tiny role is only a cameo for a singer of her standing. Although Rattle never exaggerates any of the set pieces, most of them come off very well. The giants’ motif is always taken at tempo, never slowed, but the huge brass sound ensures impact. The build-up to the anvils at the start of the Scene Three is just awesome, a real highlight of this recording. The anvils themselves are great too, and there is a wonderful picture in the liner of the six percussionists all huddled round the tiny table of instruments. Tempos in Scene Four are surprisingly relaxed, as if Rattle is pulling back to allow the singers more space to shape their phrases. But he builds up the drama again for the Gods’ Entry into Valhalla, a fitting and memorable conclusion, just a shame the harps are inaudible. Balance problems like that could have been better addressed in the studio, while greater drama may have been achieved on stage. But this concert recording is what it is, and whatever its flaws, it is definitely worth hearing. Smart packaging from BR Klassik, with a well-translated essay and - rarity of rarities these days - a libretto in German and English. 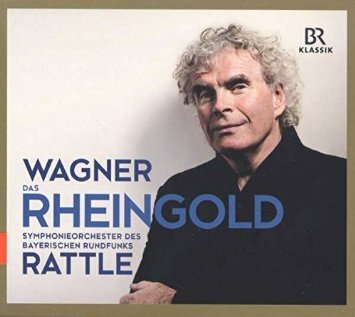 An impressive recording all round, and hopefully one that will bring Simon Rattle some of the accolades his Wagner conducting so richly deserves.